‘Twas the night before Christmas, and all through the house, not a creature was stirring, not even a mouse. And that’s because this year, Microsoft’s Santa-tracking NORAD site is touch-friendly. 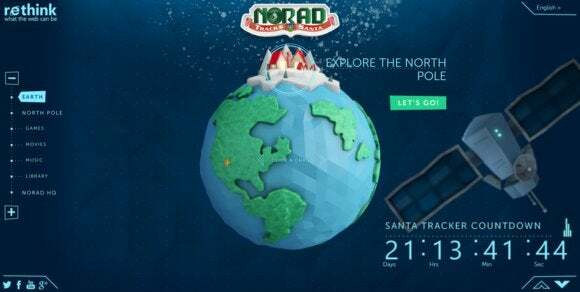 For the second straight year, Microsoft has partnered with the North American Aerospace Defense Command (NORAD) to monitor Santa’s progress around the globe. Microsoft redid the site this year, however, to allow excited children armed with Surface tablets to spin an interactive Claymation-styled globe around (beginning Dec. 24) and pinpoint when the jolly old elf will arrive in their neighborhood. The site, now live, offers several holiday-themed games (unlocked using an Advent calendar motif), holiday videos, and music. There’s also “secret Santa” files that talk about the tracker’s history, which began when an advertisement offering to help kids track Santas accidentally published the phone number of CONAD, NORAD’s predecessor. The Director of Operations at the time, Colonel Harry Shoup, had his staff check the radar for indications of Santa making his way south from the North Pole, according to NORAD. Years later, Google provided the first “data” that established the Santa Tracker Web site. (For the record, NORAD says its combined radar and satellite tracking system, together with a network of “SantaCams” and U.S. and Canadian jet fighters, provide up-to-the-minute alerts on Santa’s progress.) But two years ago, Google and NORAD parted ways, for unexplained reasons, and went with Microsoft instead.. Last year, Google’s revamped Santa tracker offered an opportunity to chat with Santa, download an Android app, and track him via Google+. The Santa Village hides videos and games. For Microsoft, it’s another opportunity to show off how sites designed for Internet Explorer and touch can mimic the apps that its platforms have unfortunately lacked. Microsoft has archived other, similar sites at its ”Reimagine the Web” site. Bing Maps will track Santa this year. It looks like Google will be directly competing with NORAD this year, however. Don’t worry, though. As Stefan Weitz, Bing’s general manager, tweeted last month (as noted by Search Engine Land) Microsoft and Google have teamed up to avoid placing Santa in different locations throughout Christmas Eve night. Best meeting of week: concall with @google to coordinate Santa Tracking Apps to avoid crushing kids’ dreams... thanks @sjttocs ! Kids can still call NORAD itself at 877-HI-NORAD to receive updates via telephone. This year, however, the site is now integrated with Skype, and it’s click-to-call functionality. Kids can also send an email to NORAD at NORADtracksSanta@outlook.com. If anyone would know, it’s NORAD.